This post was triggered by another recent post, Two worlds and in between, from Neil Usher (@workessence). It (this post) is about the power of informal communities, and issues involved in ‘harnessing’ the energy and insights generated in these self-determining self-managing social spaces to achieve business objectives i.e. to create value for customers and shareholders. Organisations are complex entities. You could go down rabbit holes and spend lots of time trying to understand complexity science. Interesting though that is, my understanding of complexity was initially influenced by social psychologists. People create, and can destroy, value for an organisation and its customers. They do this through their connections, relationships and interactions – by what they do together. Organisations are complex because of this connectedness and interdependence. Wherever you have people, you have some degree of complexity. That is true even in simple operating contexts. People do not do what they are told. They can act in the interest of the organisation, and they can act in their own interests. Someone in this short video about complexity, from the Santa Fe Institute, talks about “minds interacting with other minds“. These minds come with emotions, attitudes, desires, ambitions, and psychological needs. How do social dynamics play out in practice? What happens when two or more people come together to “hammer out their differences concerning what’s up in the organization, and what to do about it”? This is where I think things get really interesting. In Two worlds and in between, Neil Usher tells how Luis Suarez (@elsua) “made a pennydropper of a point for thinking about change – communities share, while teams solve problems”. This really is a fundamental insight. Dr Marie Puybaraud and I brought a group together in 2009 to explore knowledge management and enterprise social networking. What came through loud and clear from the conversation was that people relied primarily on personal, informal relationships and connections for knowledge and social support. Marie drew this diagram for the white paper we produced following the event (copyright Johnson Controls, 2009). The Enterprise side of the diagram is where teams collaborate to solve problems, within the constraints listed. Increasingly though, the space in between is where activity in pursuit of the organisations’s agenda takes place – as informal digital communities grow and people in them willingly apply insights generated in these communities to organisational objectives. 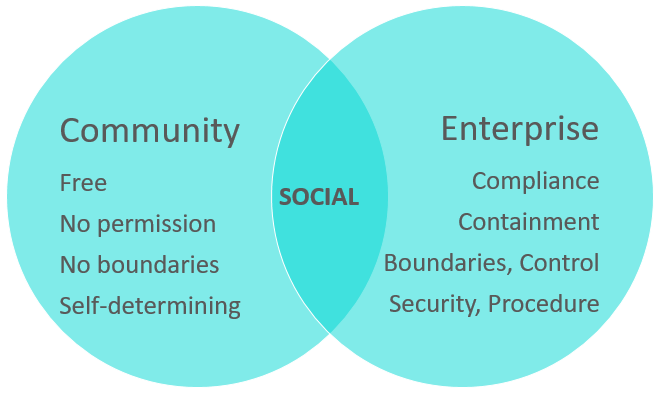 The Community side of the diagram, representing the free-wheeling, self-determining, informal, unsanctioned communities where people act according to their own purposes, turns out to be critically important. What happens in these informal communities matters a lot for what happens formally. This article is ten years old now. It bothered me then, and it still does. My reading of it is that the authors thought that informal communities “flying under management’s radar” and “eluding control” is problematic. It is obviously of great benefit to the organisation if people in these communities could share their insights more widely. There are things that organisations can do to encourage this. But while informal communities can be nurtured and encouraged by formal performance systems, attempts to control spontaneous, self-directed communities would be – I think – unwise. There are many reasons why work is becoming more socially complex but a look at just one trend – open workforces and some of the forces driving it – is enough to illustrate. Another source of openness is the gig economy, which is on the rise: employment arrangements that include a mix of permanent, fixed term, and freelance contracts. This fluid, kaleidoscopic workforce has implications for how work is managed, and how workplace relationship form and are sustained. The trend increases social complexity, as fluid relationships and interactions reach across organisational boundaries. I sense increasing social complexity is particularly impacting people in operations. It is no longer just senior executives that need to develop skills for thinking and acting in complex contexts. People will need to update their skills to reflect increasing complexity, and learn to adapt as work evolves. As before in the previous shift from traditional manufacturing to customer-focused, process-innovation approaches, businesses will need to innovate how they mobilise and coordinate the connected knowledge, capabilities and experience of their increasingly open workforce. They will also have to pay attention to how performance is supported. 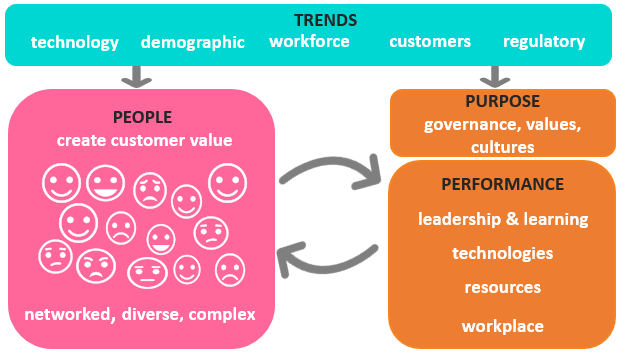 I’ve been interested for a long time in formal performance systems that generate conditions where people can effectively work together to create value for a business and its customers. The Purpose and Performance elements in the diagram below are widely-recognised elements of high-performance work systems, and process-innovation approaches like quality and lean. These centre around customer-focus, innovation as everyone’s business, plus problem-solving and learning sewn into everything the business does. These things coincide with what people apparently need from work. If the social psychologists, Edward Deci and Richard Ryan are right, in general that is autonomy and developing competence in things that we care about. For those responsible for shaping performance environments, this means trying to understand how others see a situation, supporting their explorations, encouraging them to have a go at doing something, making sure people have choice in what they want to do, and how they do it, plus making sure that they have the resources, time and space. Facilitating the space in between means understanding what people need to get on with creating value for customers and shareholders. There’s plenty of existing research and insight on what that is. It might be being largely ignored but that’s another matter. Recognising and accommodating the power of informal community is critical in that effort. There’s a much longer way to go on understanding how to do that, I think. The third thing that Deci and Ryan say people need is relatedness, which is being connected, feeling a sense of belonging and being cared for. We are back to the power of communities, Luis’s observation that “communities share, teams solve problems”, and the fact that people share and cooperate in communities for a variety of self-determined reasons. How could formal systems support these informal communities? They could nurture and encourage them (digital or in person) by giving people tools, time, opportunity, space and place to play with ideas. In Pentland’s MIT research, mentioned earlier, this meant something as simple as recommending that management of a call centre in a bank ensured that team members all took their breaks at the same time. The executive summary of the WEF Future of Jobs report notes that education systems will have to be re-thought in the longer term, as the so-called fourth industrial revolution unfolds. Meanwhile those of us outside the constraints of higher education institutions can offer innovative ways of developing skills. What trends are affecting the business (or are likely to)? How might this affect how things are currently done? What could be adapted, improved, dropped, tried for the first time? The aim of this exploratory phase is to get a ‘big picture’ view that will spark ideas for possible things to do. Do something – what’s feasible? Reflect on the experience, using the Skills Grid to monitor and map. What are your options for the next experiment? Experiments are facilitated in short bursts. Small steps mean that people can succeed or fail fast, learn, adapt and repeat. People choose to do something they care about – the futurist, Ray Kurzweil, call these ‘passion projects’. Short bursts give people the opportunity for more frequent recognition and opportunities to celebrate (and even to show off a bit). The experiments are an opportunity for people to shape the performance systems that they use to support them in what they do – if that’s what people care about. Mastery takes time and practice. This approach enables skills development at a pace that suits individual people. Activities on the 10-week programme are completed individually, with colleagues in the workplace, and with peers online. Community builds as people share and get too know each other. The approach is one way in which learning communities can be nurtured through a facilitator who acts, with a light touch as a coordinator (on the Goldilocks principle of ‘just enough’), ensuring that everyone has the support and resources that they need. One of the roles of the facilitator could be to ensure that insights from the community (subject to confidentiality, and with permission) are fed back into into the wider organisation, celebrating and recognising achievements, and sharing learning on why something succeeded or not.